Movie Review: Aiming to please the masses, “Samba” is brought from France by the team of directors, Olivier Nakache and Eric Toledano, who have made a smashing success four years ago with the enjoyable “The Intouchables”. 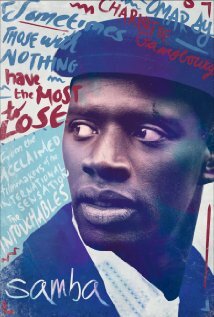 As in the latter, Omar Sy is the main character, this time playing Samba Cissé, a Senegalese migrant who keeps trying to regularize his situation in France to avoid deportation, after ten years working as a dishwasher in Parisian restaurants. Therefore, and despite of the score featuring Gilberto Gil and Jorge Benjor, “Samba” the film, rather than enhancing the dance genre, tries to portray the sad reality of this man, even if using bland routines to do it. After being caught by the authorities, situation that requires a temporary detention and presence before a judge, Samba gets help from an NGO whose new volunteer, Alice (Charlotte Gainsbourg), a sleepless senior executive under medical leave, feels sympathy for him and his case. Despite the warnings not to get too close to the undocumented people, Alice falls for Samba who, in the meantime, sleeps with the ‘vanished’ girlfriend of his friend Jonas. Facing difficult situations in the occasional jobs he accepts, and under the pressure of sending money to his unfeeling mother, Samba will rely on his ‘Brazilian’ friend, Wilson (Tahar Rahim), to give him a hand, while he begins a relationship of proximity with the anxious, and sometimes frenzied, Alice. Some of the little fun that arises from watching this too polished drama comes from the difficult communication among aid workers and migrants. As for the rest, the film slips in a few scenes, which sometimes are feel-good in the cheesiest way, sometimes are awfully unreasonable. All this is aggravated by the fact that the romance between Samba and Alice doesn’t spark good vibes. The film might draw some interest to viewers who are looking for dramas with warm stories and happy outcomes. For the ones looking for something original and solid, “Samba” doesn’t dance so well.